Color deficiency occurs when your ability to distinguish certain colors and shades is less than normal. 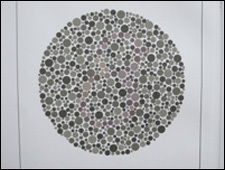 The term COLOR BLIND is often used but usually incorrectly. Only a very small number of people are completely unable to identify any colors. Color deficiency is usually inherited but can also result from certain diseases or trauma or as a side effect of certain medications. It happens when the color-sensitive cone cells in the retina of your eyes do not properly pick up or send correct color signals to the brain. There are two major types. Red-green deficiency is by far the most common and results in the inability to distinguish certain shades of red and green. These people could have problems distinguishing, for example, blue from aqua or green from teal. Blue-yellow deficiency is less common and affects the perception of blue and yellow colors. In very rare cases, color deficiency exists to an extent that no colors can be detected. This person sees all things in shades of black, white, and gray. People who are color deficient are often unaware of their condition. They assume that everyone sees things the way they do. As a result, a complete optometric examination, including a test for color vision, is recommended. A test for color deficiency is relatively simple and typically involves viewing a serious of colored designs or objects. The designs have been crated in such a way that a person with normal color vision can see certain figures in the design. A color deficient person will not be able to distinguish the figures. Sample plates form the Ishihara color test. 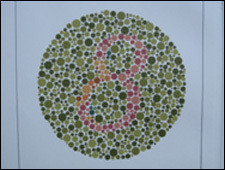 People who are not colored deficient should be able to see the numbers "5" and "8" respectively. someone who has a red-green color deficiency. Every child should be checked for color deficiency by at least age five. It is important to detect color deficiency early because color-coded learning materials are used extensively in the primary grades. In addition, color deficiency may affect the career path of an individual, since the ability to distinguish colors is an important aspect of some jobs, such as pilots, electricians, some military personnel, police officers, and others. Unfortunately a cure for color deficiency has not been discovered. 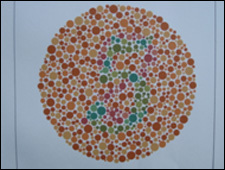 A person with color deficiency, however, can be taught to adapt to the inability to distinguish colors. For example, you can be taught to recognize the brightness and location of a traffic light rather than the color itself. It is sometimes possible to increase the ability to distinguish colors with the use of special filters. A special red tinted contact lens can be used in one eye. In some cases other devices are used to aid persons with certain color deficiencies. These devices have found little success.